Akris Cotton Navy Zipper Sporty Sheath Dress with Pockets Size 4. AKRIS peasant style dress comes in sheer black sheer cotton with a wrap V neck, short eyelet lace trimmed sleeves, and tiered A line skirt with wrap tie belt. Made in Switzerland. Very Good Pre-Owned Condition. Marked: 8 Measurements: Shoulder: 14 in. Bust: 34 in. Waist: 32 in. Hip: 38 in. Sleeve: 4 in. Length: 41 in. 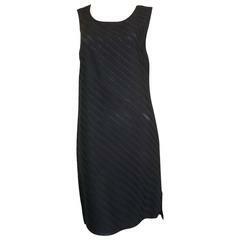 Simple and elegant black cotton dress with a diagonal pleat effect pattern. 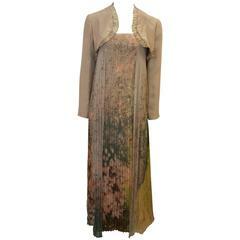 This dreess has a round neck, and the lining is of light soft cotton. Swiss company but made in Italy. Akris Limited Edition Bergdorf Goodman Silk Dress $450 100% Silk Size 12 Length 41" Bust 36" Waist 32"
Akris White Print Dress with Belt NWT 100% Cotton Size 14 Length 40.5" Bust 42" Waist 40"